In this season of giving thanks, we at Greenfox Schools would like to thank all of you for your ongoing support. Greenfox has had a great year working with students across Cambridge and helping to instill in them the value of protecting and understanding our environment. This month’s newsletter focuses on the importance of sustainability and the programs we run with fresh perspectives from our program director and teaching interns. These individuals make a difference each week in the lives of children around Cambridge and in the articles that follow, they share those perspectives with you. Greenfox fall programming is in full gear as we move past the halfway mark for classes. We have currently covered all 5 categories in the Greenfox5 model, including lessons around the water cycle (Greenspace), organic gardening and composting (Food / Waste), recycled paper (Products) and solar / wind power (Energy). Sustainability is our future and these programs provide a unique opportunity to connect it on a fundamental level with our children, who will be the ones that will be our future. Karl Daruwala and Sarah Stickney have been outstanding Teaching Interns and their full thoughts on the program will be listed in more detail in this newsletter. I’m excited to be working with such an amazing team here at Greenfox and we will finish the semester strong. Stay tuned for more updates! I’ve had a wonderful experience helping with the Greenfox after-school programs this fall. I have been working with a class of six kids at the King Amigos School near Central Square in Cambridge, and we’ve been able to teach most of our classes outside in the City Sprouts garden. Highlights include turning the compost (the kids were really excited about it! ), making and hanging pollution catchers, creating water cycle models, and making recycled paper. All of the kids are smart and engaged, and it feels great to be teaching them interesting and useful environmental concepts. I think the Greenfox programs are making a big impact in Cambridge public schools! I’ve had a wonderful experience helping with the Greenfox after school programs this fall. I have been working with a class of six kids at the King Amigos School near Central Square in Cambridge, and we’ve been able to teach most of our classes outside in the City Sprouts garden. Highlights include turning the compost (the kids were really excited about it! ), making and hanging pollution catchers, creating water cycle models, and making recycled paper. All of the kids are smart and engaged, and it feels great to be teaching them interesting and useful environmental concepts. I think the Greenfox programs are making a big impact in Cambridge public schools! We hope you all had a wonderful Thanksgiving that you enjoyed our newsletter this month. Visit our website and Facebook page to learn more about our programs and the way they are impacting students across Cambridge each day. Stay warm and think green as we head into the holiday season! The special eating place called Clover in Harvard Square is fully supplied by Vegware. 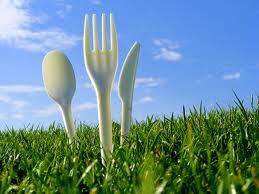 Vegware manufactures completely compostable cutlery, tableware, and takeout packaging. Clover is a unique setting to grab a cup of coffee, soup, or have a meal. The pace is calming, the service excellent. The place is abuzz with good feelings. Clover composts nearly everything including food waste generated in making the food, coffee grounds, and post consumer food waste including the Vegware. 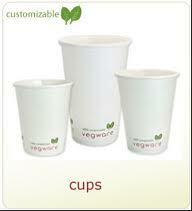 Vegware is made from virgin vegetables or from a sustainable forest. 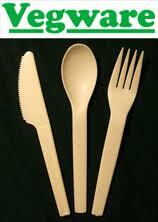 Vegware is completely compostable.